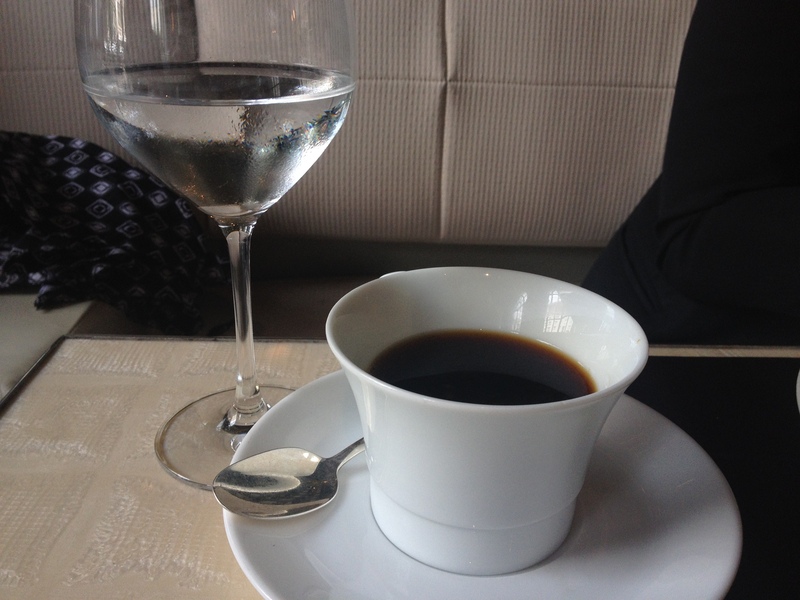 If coffee is the highlight of a three-course meal, that says something. About the coffee. The interior is refreshing, with generous splashes of white decor and sparkling glass and stainless steel. Out in the calm Sunday streets, slight bits of rain drizzle here and there, but the rays of sunlight beaming through the tall windows bounce across all corners of the quaint and modern dining area. Anyone with any taste in jazz understands how despicable “smooth jazz” is, also affectionately known as “elevator music”. If one was in a pissy mood, if the clouds were gushing rains instead of drizzling, if St. Regis Hotel’s Adour’s executive chef wasn’t known for his immaculate cuisine, then yes, what rings in my ear could be classified as elevator music. But not today. Today, the same tunes shall be ordained as “chic” and “modern”, to accompany the furniture and ambiance. The quality of a restaurant’s bread basket is indicative of its overall sophistication, and this batch is divine. Perfectly crusted, just enough salt, nutty aroma, two types of butter. Don’t even need olive oil and balsamic vinegar. Bread for bread’s sake. Monkfish is not something you see everyday on menus across town. The creature’s cursed appearance may alienate cooks and foodies alike, as its alien-like countenance does not exactly spell out haute cuisine. But i kid you not, monkfish, when handled and cooked correctly, offers some of the most delicate and flavorful eating excursions known to our species. The best parts of the beast are not its flesh, but its skin, cartilage, and everything gelatinous in between (in fact, the liver of the monkfish is the most prized delicacy, but too rare to expect at Adour). The white flesh is firm but mild in itself, and tastes best when eaten together with the skin. Woe is me, there lies a white fillet with no skin, no gelatinous goodness. The portion is pitiful, but I have hope in the yellowish golden sauce caressing the sorry fillet and entourage of greens. And I am not disappointed. The mustard seed-based sauce is superb, with just the right amount of acidity to enrich the otherwise bland fish. And the perfectly cooked pearl onions are a bonus. 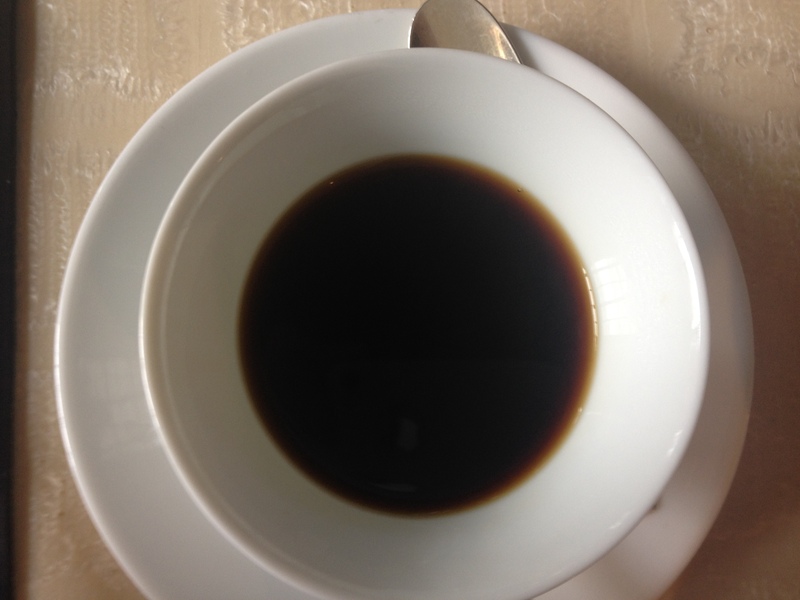 As I always preach, the first sip of coffee is most critical. It is the alpha and the omega; it tells all of the rest of the cup and the pot. My first taste of La Colombe, and I am transported to Corsica. Cocoa darts out first, then various notes of nutty and fruity flavors. Bold but not burnt like Starb__s. The depth of flavor is profound. The acidity is just enough to dance around on the tip of your tongue, yet still strong enough to enclose your tongue and drench it thoroughly. The aftertaste is light, automatically sending your hand and mouth for sips to come. The chocolate and hazelnut praline is the perfect compliment to this perfect cup of liquid gold. Alternating between forkfuls and sips, my mind wanders, to nowhere in particular. I lay down my cotton napkin and push my chair in like a learned gentleman. Monkfish or no monkfish, I say to myself, long live La Colombe.